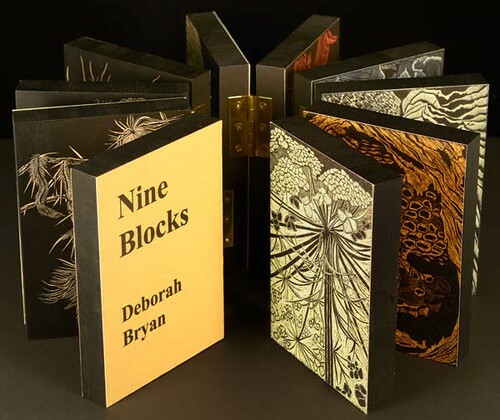 An exhibition of recent books and prints by Tennessee artist Deborah Bryan. Bryan is on faculty at Tusculum College, Greeneville, Tennessee. Ms Bryan’s work was first exhibited at Abecedarian during the RE: (rebound, recycled, repurposed, reused) exhibit when she was awarded the gallery director’s exhibition award. Her work for this exhibition involves using plates, whether copper or wood engraving, as covers or pages, and involves presenting prints in an alternative format. On display are both prints and books; the books, although created from a medium usually associated with multiplicity, are not editioned but are one of a kind books, using retired copper plates and woodblocks. 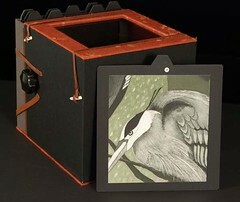 For me, the artist’s book provides an opportunity to present my work in a different format, hence the title “Look Again.” As a printmaker, I regularly find myself with a completed edition and used, but beautiful, copper plates or endgrain maple blocks. These matrices can become pages or covers. 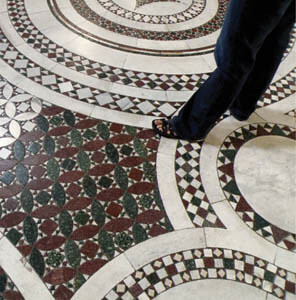 Proofs can be recycled and reconfigured as content for books. This the inaugural project published by Marginalia Press, the press of the MA Art and the Book program at the Corcoran College of Art + Design. The artists are members of the inaugural class of the program. The piece is a collaborative project exploring the nature of heredity and the human genetic code. 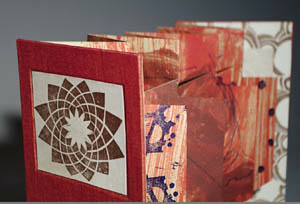 Created with a combination of digital, letterpress, screenprinting and etching, cutouts in the main textblock create recesses that house two additional books, rendering the back sections of the main book difficult to access. The two books housed in the cavities are engaging and appealing on their own. 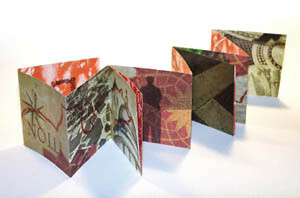 One is a flag book/accordion book combination with each page a printed card front and back, the accordion spine a translucent sheet with photographic imagery. 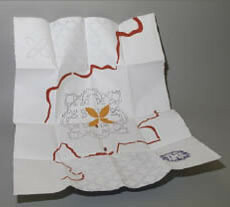 The second is a captivating pinwheel accordion book. This work is dense with information and ideas but so visually and tactilely engaging that it interests on multiple levels. As the book is done as part of an academic program, rather than by artists in private practice, it offers great bank for the book. There are several buying options for this work. Each box contains 50 books. The entire 5 box set (50 books) is $2500, individual boxes (10 books each) are $600 each and individual books are $50 each. 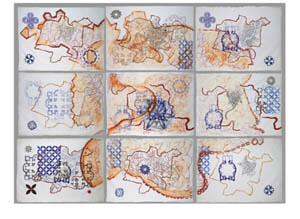 Andrea Crane creates multi media works that portray stories of her past and present. 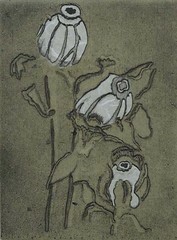 Her works have been exhibited in Emanuel Gallery, Foothills Art Center, Box Car Gallery, and Center for Visual Art in Colorado. She attends Metropolitan State College of Denver in pursuit of a Bachelors Degree in Fine Arts. This book is engaging in ways reserved for the small scale and simple. 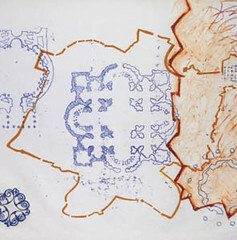 It celebrates mark-making in a variety of ways (burning, paste paper and deliberate placement) in a small, easily accessible format. The color palette is limited but dramatic, and although only a a few variables are used, each page spread is quite different then any other. This book has been sold. 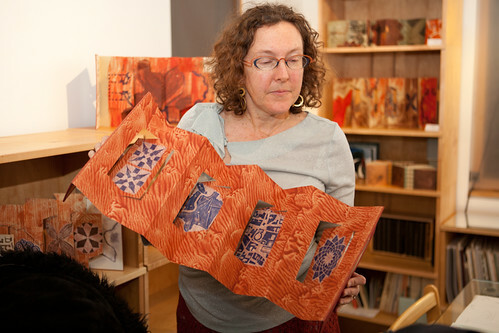 Cindy Stitler has been making books since 1994, when she studied at Penland. She taught at the Taos Art Institute and many private classes and workshops over the years. One of her books was purchased by the Denver Public Library’s for its Western History Collection, and others are held by private collectors. This little gem is in a variable edition of 7 copies. The book price is $175. 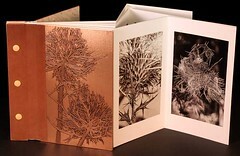 Amy E Robinson is a book artist in Portland, Oregon. Her work focuses mainly on exploring the identity of humans, how much we or don’t know about each other, or even ourselves. Amy’s work attempts to bring notice to the uniqueness or quirkiness of individuals that may be overlooked. Charlene Asato with text by William Blake. I see a lot of tunnel books these days, most of them edition works and imagery based, rather than text based and smaller in scale than this one. This unique tunnel book by Charlene Asato is entirely handpainted and lettered, the calligraphy text written around the edges of the cut circle shapes on each page, diminishing in diameter front to back. The watercolor weight pages are heavy and stiff enough for the book to display well fully extended, the space between each successive page adequate to allow that each page be accessible to a viewer. One of my favorite aspects is that the side panels are also handpainted with a tiger stripe pattern. The book title is on its own handpainted panel on the inner front cover, the deceptively plain exterior of this book has the title debossed. This book, containing as it does 6 watercolor paintings, is an of the obvious example of the undervaluation of artists’ books. 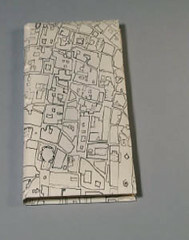 It is a one-of-a-kind work and is priced at $300. 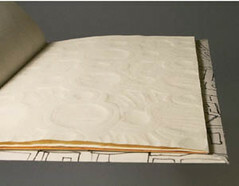 Bookbinding captured Charlene Asato’s interest over 25 years ago when she was learning calligraphy in the SF Bay Area. 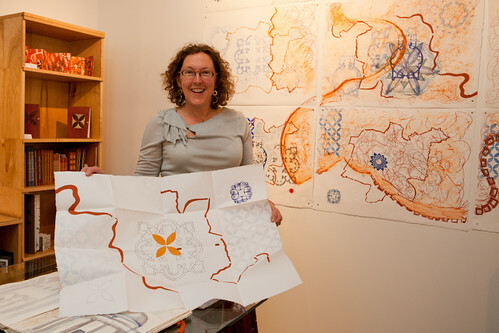 In Hawaii for the past seven years, she focuses on incorporating her art pursuits into her artist books, i.e., calligraphy, photography, paper surface design, watercolor, embossing, linocuts, origami, assemblage and collage.